These exceptional Air hanging planters are a throwback to the organic shapes found in mid century modern Danish glass design. These exquisite sculptural terrarium-styled glass planters look like a raindrop suspended in space. These modern air planters are perfect for courtyard gardens, indoor gardens, apartments, lofts, restaurants, hotels, spa resorts, etc. The perfect cure for the urban apartment with space constraints, or, apartments where traditional planters are simply not an option. If you have a big New York City loft space for example, it would be wonderful to suspend a high number of these in order to create your own gardens in the spirit of the hanging gardens of Babylon. 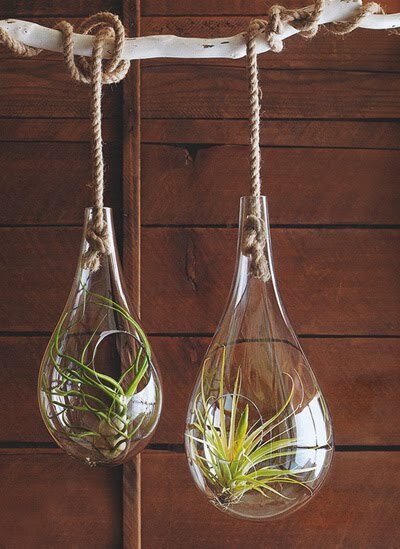 Highly decorative in form, these finely crafted glass hanging planters create a relaxing and peaceful display. Our Air Planters are fashioned from recycled glass by master glass blowers. Bubbles, dimples, rippling and natural flow marks add to the artisan appeal of these suspended glass vases. Each Air Planter features a 3" opening in the front and an 8' sisal rope for hanging. Ships complete with our low-maintenance Tillandsia air plant. Intended for indoor use only.